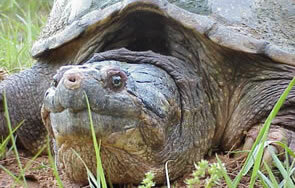 These are the largest of the freshwater turtles in North Carolina. They are found across that state and are easy to distinguish by their long necks and tails. Snapping turtles and great swimmers and get their name from the aggrieve way they attempt to bite when disturbed! With a distinct flat body shape the spiny soft shell turtle has leathery studded skin. They are rarely found out of the water, preferring soft-bottomed water bodies. They utilize long necks and think snorkel like noses for breathing. These tiny turtles prefer wetlands as then spend a majority of their time buried in the mud. 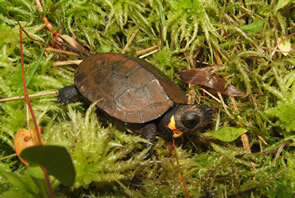 The bog turtle is the smallest species of turtles in the United States and is distinguish by two yellow-orange splotches on either side of its head. There name is derived from the flavor of their meat. 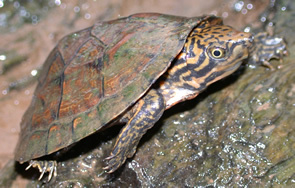 With a net-like patterned neck and unusually long neck these semi-aquatic turtles are often found burrowed in the soil if conditions become too dry. Diamondbacks are primarily found in brackish water, though they can survive in freshwater they prefer the coastal marshes as their diet mainly consist of snail and crabs, so much so that they are often found in commercial crab traps. These turtles have a highly domed carapace and a hinged plastron. 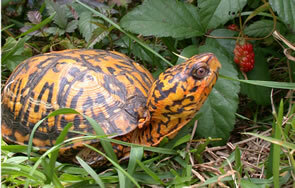 Box turtles are the only species which can shut their plastron completely, these are also the only fully terrestrial turtles found in North Carolina. 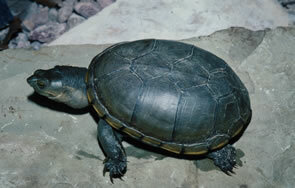 These herbivorous aquatic turtles are often found basking on downed logs along river banks. 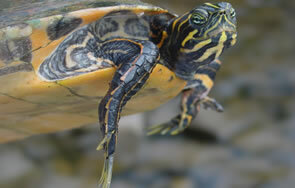 They can be hard to differentiate from the river cooter, yellowbelly slider, and redbelly turtle. 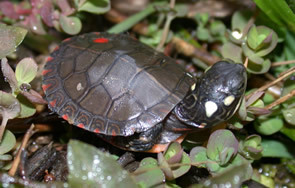 As its name suggested the painted turtle has a unique shell with red, black and yellow accents. This species is easily observed as the animals prefer to bask in the still or non-moving or lakes and ponds. 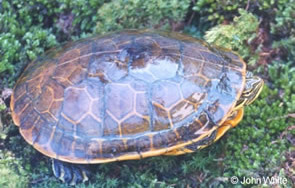 The top of the shell is often brown or black with vertical yellow and orange markings, while the belly bottom is orange-red. 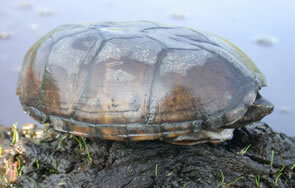 Its skin is black with thin yellowish stripes and they are known to hybridize with Florida cooters. 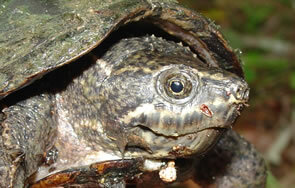 These herbivorous aquatic turtles are often found basking on downed logs along river banks. 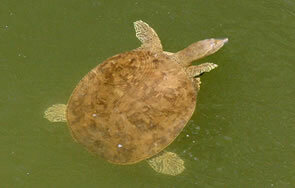 They can be hard to differentiate from the Florida cooter , yellowbelly slide, and redbelly turtle. 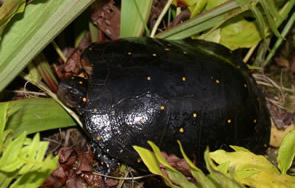 The dark shell and distinct yellow spots make the aptly naked spotted turtle easy to distinguish from other aquatic turtles. Preferring the damp vegetative habitat of marshes and swamps these animals prefer slow-moving shallow water. 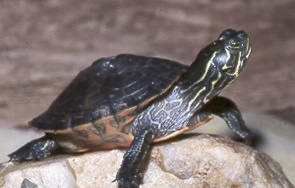 With a distinct yellow plastron and bright yellow and green striping the yellowbelly sliders is a common social basking turtle found in lakes, rivers, streams, and ponds from the piedmont to the coast of North Carolina. 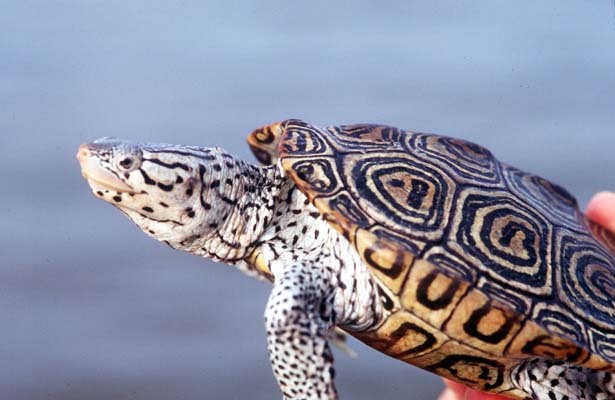 The one thing that stands out about the North Carolina stripped mud turtle is the complete lack of strips for which this particular species is named! These animals are semi-aquatic and are often found buried beneath the foliage. Small and smooth the eastern mud turtle is not a very good swimmer, preferring to crawl along the bottom in search of food, they can be found in salt marshes though they prefer freshwater. 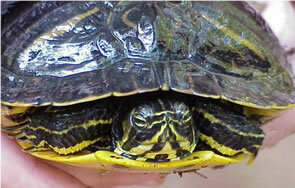 Thick bands on the neck an head are a tell-tale sign of the striped musk turtle. Found in the river and lakes of the North Carolina mountains little is known about this particular species. Aptly names the musk turtle will resale and pungent smell when threatened. They are a very aquatic species and are found all over North Carolina.